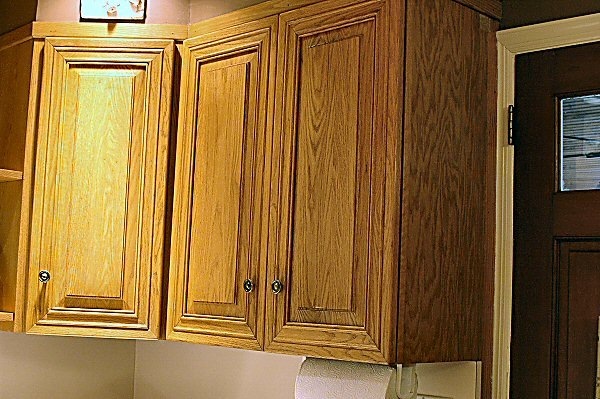 Every year for the last 17 years, I look at my fugly oak kitchen cabinets (pictured above) and fantasize about calling the cabinet guy to have a new fancy smancy kitchen installed. And every year, I get sidetracked (as does my budget). To redo a kitchen here in NYC, I was looking at $35,000 to $45,000…that’s not chump change! 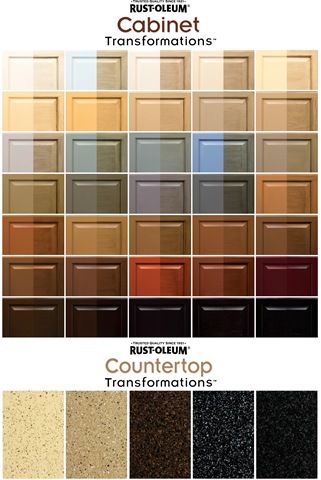 So after searching the web for instructions on how to redo my kitchen cabinets, I came across Rustoleum’s Cabinet Transformations. I played around with their Virtual Tool to see what would look best in my kitchen. The kit claims there is NO STRIPPING, NO SANDING, and NO PRIMING! Sounded too good to be true. It’s a four step process. First you “degloss” your cabinets. Then you paint two coats of the primer/base color. After that you can glaze it (basically brush it on and then wipe it off) to give it a more detailed look. Finally, you paint on a sealer. But the best thing about it is it’s a WATER-BASED product! No fumes, easy clean-up! So if I totally screwed it up, at least I would be able to clean it up easily. I headed over to my local Home Depot where the staff knew absolutely nothing about this product. Great. So I through caution to the wind and picked up two Light colored kits. I probably could get away with just one kit, but was not taking any chances of not having enough for finish my kitchen. A small kit will cost you $80. They have a large kit, but it wasn’t available at the store. Had my kits mixed for the Pure White base color (the first color on the chart below). 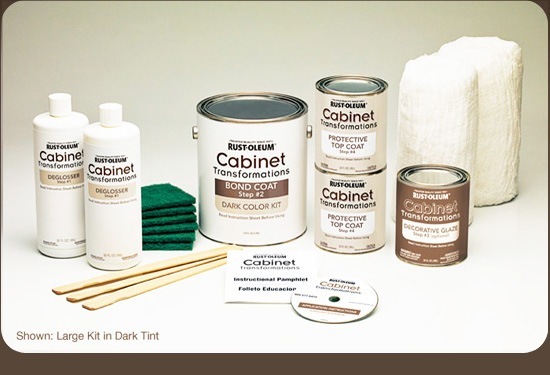 There are two types of Cabinet Transformation Kits. You choose either Light or Dark depending on what color you’d like. Then the nice paint guy at the store mixes your base color. It’s times like this I wish Mr. Diva was handy. But no such luck. However, he has no problem with me hiring help. So, I paid my housekeeper an extra $20 to scrub the cabinets down first with the Deglosser. You wouldn’t want me ruining my manicure, right? I then gave my daughter’s boyfriend $40 to remove the kitchen cabinet doors and drawers, tape the walls, and empty most of the contents. Of course, the Knucklehead broke one of the 20-year-old discontinued European hinges. But not to worry…I found USA Cabinet Hardware on the web! I just sent them photos of the hinge and hope they find me a replacement. Fingers crossed. Then I gave Marielle’s boyfriend another $40 to put the first coat of Base paint on. And I soon realized he was no painter. So I took over. When painting the cabinet doors, get yourself a few 2” x 4”s. Put a few nails in them to rest the doors on. I placed the 2” x 4”s on a large table spacing them to accommodate the doors. This raises them off the table so you can paint the sides easily. Be prepared to live in chaos for a while. But the good thing is you have an excuse not to cook. Be sure to have lots of food delivery menus on hand…LOL! 2 coats of Base paint/primer? Nope…I know paint and it definitely was not enough coverage. Glad I bought that extra kit (even though the online calculator said I wouldn’t need it). My cabinet frames needed 3 coats and my cabinet doors needed 4 coats of base paint. Next up was the Glazing process. This was the easiest for me. But then again, I’ve glazed so many surfaces over the years that is was second nature to me. My suggestion is to work in small sections at a time and use as little glaze as possible. You can always add more glaze if you want it darker. When Glazing, you need to work quickly as the longer you keep it on, the harder it is to wipe off. After the Glaze has dried a day or two, you can paint on the Sealer. I used two coats of Sealer to ensure I got good coverage. 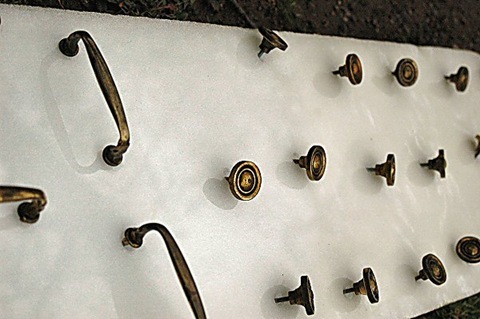 My cabinet knobs and drawer pulls were as ancient as my cabinets. They were an antique gold cover and worn from use over the last 17 years. However, I still liked the style of them. After pricing replacement hardware, it seemed silly not to just paint them! I love the rusted iron look, so I went with my tried and true method: Rust-Oleum Rusty Metal Primer and Satin Chestnut Brown (#7774). First, I got a big piece of Styrofoam, covered it with plastic sheeting and stuck the hardware in it (using the screws on the back of the hardware). I then spray painted them with the Rusty Metal Primer. Once that dried, I lightly sprayed a little of the Brown Chestnut Satin. Finally, I sealed them with some clear gloss sealer spray paint. And there you have it—new kitchen cabinet hardware for under $10! Genius. Lastly, I ripped off the old mint green vinyl wall base (aka kick plate, cove base) that no longer matched my decor. 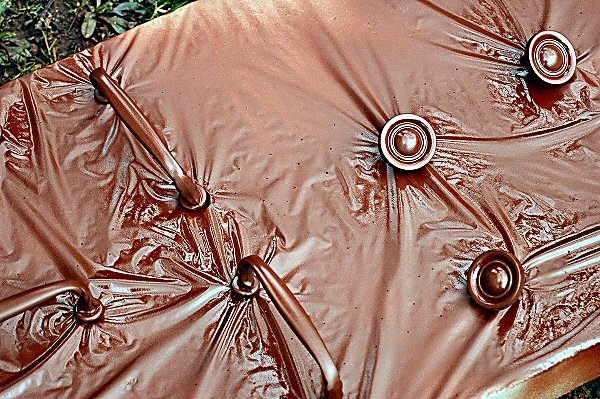 I bought new Chocolate Brown Vinyl Wall Base for a mere $1.67 a piece. I only needed 6 to redo the base of my cabinets. To do the job properly, I also purchased the appropriate adhesive and spreader tool. Total cost for new vinyl wall base…$21.00! This should be pretty easy. All you need is a utility knife and a blow dryer (to heat the vinyl so it easily bends). Still haven’t gotten to this job, but hopefully before the big BBQ. Yes, it’s a lot of work for someone lazy like me. But the results are well worth it. Mr. Diva loves it—he thinks I’m amazing. He certainly had his doubts throughout the process…often making snide remarks on how I was destroying “his” kitchen cabinets. Even my professional painter friends were impressed with my results. But I think the best compliment came from the kitchen remodeling guy who came to measure for the new countertops and backsplash. He asked me where I purchased my “custom” kitchen cabinets…adding that they probably cost me some big bucks. When I told him about the Cabinet Transformations product, he was amazed! He said that in order to get this type of custom finish, he has to send out the factory “custom” cabinets and his customers can easily spend upwards of $40,000 for a full kitchen. And then he asked me if I wanted a job doing this for him. Um, NO. LOL! WOW!!!!!!!!!!!! Lisa is it beautiful! You did an excellent job. I love it. Looks fantastic. 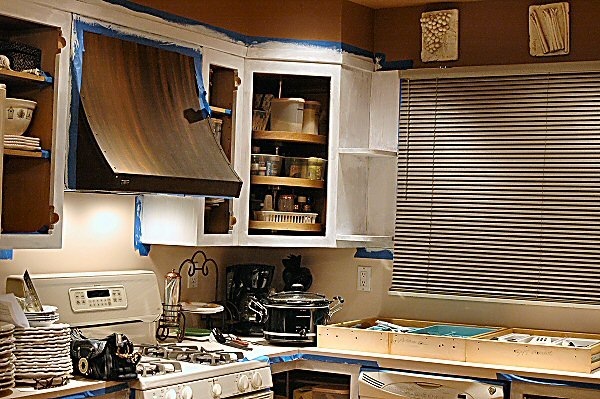 Rustoleum has a contest going on where you can submit your before & afters — you should enter! I love how it turned out. 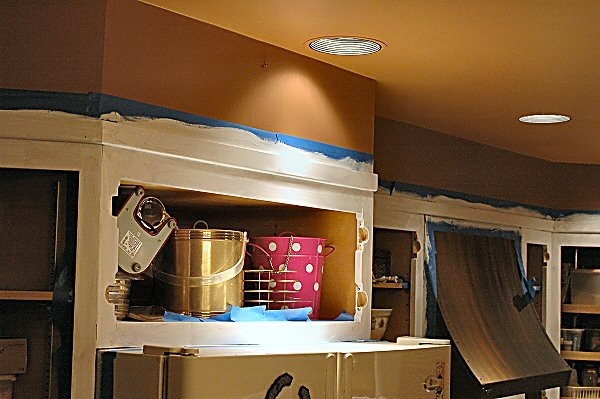 I’m thinking of doing this to my kitchen cabinets. They’re new but not my style, so its silly to replace them at this point. My cabinets don’t appear to be solid wood like yours. Do you think this product will work for me? Asked at the local HD and they were clueless, lol. Holy cow! Your cabinets turned out fabulous! I am forwarding this makeover to my husband! Jennifer…definitely give it a try…it’s well worth the money. I have doubts about their countertop product and instead opted for granite (got it wholesale). You might want to check into a stone-look formica–it’s the cheapest way to go. Absolutely! This product works on almost everything from wood and pressboard to metal and laminate. I found my local Home Depot guy to also be clueless. I’ve since educated him…ha ha! thanks Pam! Yes, I saw your post on another post and did enter the contest! I’d love to win…so I can pay for my countertops! Lisa, it is beautiful! Your cabinets are just gorgeous! Nice job on the cabinets! Personally, I didn’t think the originals were bad and might have done something with the backsplash. But I do like the new version. My eyes aren’t cooperating today – can you still see the wood grain? Thanks for the great review and tips on using it. You did a great job!! looks amazing! I also bought this kit in the exact same color, but I wanted it to be white-white, without the glazing, since my kitchen is modern. Well… I do NOT recommend choosing the white (or maybe even the other very light colors) without the glaze. My husband and I took 4 days to paint our cabinets (my kitchen is 10 x 8!!). Endless trips to HD and endless coats of different types of paint!! It looked terrible… At day 5 we were giving up, but tried one more paint, which was the exterior enamel by rust oleum as well that saved the kitchen. Now the kitchen looks beautiful, but it was way more work than we anticipated! For everyone reading this blog, do not buy this product if you’re not using the glaze. The glaze kind of covers up what the paint didn’t cover, so it looks great, but without it it just looks terrible, you’ll want to cry and throw your cabinets away! Thanks Valerie! I totally agree with you—the lighter color paint finish alone doesn’t look good–you need the glaze to hide the imperfections of the paint. And yes, it’s a lot more work than you think. I’d love to see pictures of your finished cabinets. Post a link! Thank you for sharing your experience with this product! I have been thinking about trying this product since I first heard about it several weeks ago. I intend to start with the bathroom cabinets, to “see how it goes”. I looked at all of the entries at Rust-Oleum contest site and yours is the BEST! Great job! thanks June! Wishing you success with your bathroom cabinets! LOL Christine! Do it!!! You’ll be glad you did! O.M.G. Those results are mind-boggling. I would be tempted to try it myself it I hadn’t learned the hard way (repeatedly), that some people are more talented than others at this sort of thing…. Me? Not so much…. Great job. Thanks Beth! You could always have your husband or brother do it…LOL! just stumbled across your site while looking for reviews for this product. li have cabinets similar to your “old” look and want to do something with them. yours ooks absolutely amazing! i am inspired. Thanks Jennifer! It’s definitely worth doing–just think of the money you’ll save! Good luck! Your cabinets look amazing! I am trying to get something similar in our kitchen but have been finding the wood grain turning yellow between coats (I hear you on the four coat thing). Is this something that happened to you, if so will the glaze solve this problem? Thanks! Again, your kitchen looks great! Ashley, my cabinets had a yellowish tint to them before the 3rd coat. The glaze solves most problems. However, if your cabinets are coming out a little “yellower,” I would use less glaze. You could always add more glaze if needed, but can’t make them lighter if you overdo it w/ the glaze. Good luck! Diva, You did a totally awesome job on the cabinets! I’ve looked at that product at the hardware store and wondered if it really does work as easy as they claim. I’ve sanded a spare cabinet door, primed, painted with different colors to test different off whites and chocolate glazes. None of my samples turned out as I wanted. I see now that, if chaos can be tolerated, this kit is the way to go! Thanks for posting your awesome kitchen transformation! Hey Debra…thanks! Yep…a little chaos for sure, but totally worth it as the results are great! Good luck! Lisa!! That is a fantastic DIY project! Your kitchen looks amazing! Great job! Thanks Deela! I’m so glad I did it! your cabinets look amazing. I am very impressed with the results. (do you work for rustoleum 🙂 ?) I am wondering if this product with work on cabinets that have already been painted. 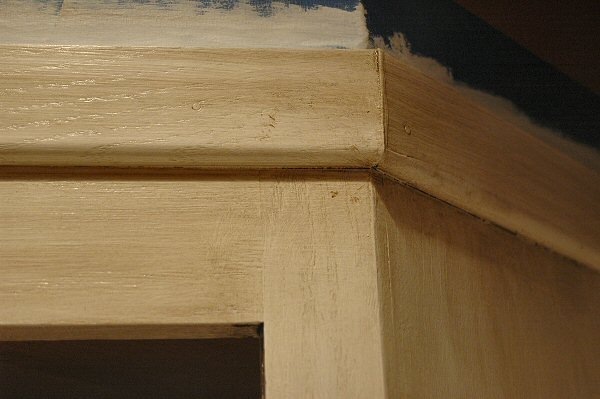 I painted my cabinets 6 years ago with benjamin moore melamine paint as I was assured it was the most resilient paint. It was horendous to work with and took forever to dry and wasn’t worth the aggrevation because it started coming off around some of the door knobs within less than 6 months (and I had no more paint to touch up). I now have quite a few spots showing the original cabinet underneath and trying to colour match & touch up will be futile I think. I am hesitant to go through that process again (once burned, twice shy as they say) to only find that the rustoleum product doesn’t adhere to the melamine paint. Would love to hear your thoughts (as we know the home improvement store associates don’t have much knowledge regarding this product). Thanks so much. Sooo inspiring! I started the process! I am a stay at home mom to 3 (4, 3 & 1 yr olds) and taking advantage of 2 of them being at pre-k 3 days a week and the baby’s nap. My husband thinks I’m off my rocker, maybe I am!? but I think it will totally be worth the pain. My plan is to do it in sections and take my time. Wish me luck! That’s awesome Kristin! You can do it! I took my time and am glad I did! No cooking or dishes for quite some time…LOL! Good luck! Let me know how it turns out. I just wanted to comment on the post from the reader who said that the product didn’t work well without the glaze. I used Winter Fog, one of the lighter shades, in two coats with no glaze, and I thought it was perfect. Not a single problem at all. I can’t recommend this product highly enough to my friends (and no, I don’t work for Rustoleum, LOL). I have a large kitchen and bought two kits, but I have plenty remaining to do the built-in cabinetry in the adjoining family room. The pictures can’t even do it justice. WOW! Your kitchen cabinets came out GREAT! Did you redo the countertops, too? Thanks for sharing the info! Oh, and good luck in the contest…I entered too. There were some pretty amazing before and afters. I did think you had one of the best applications of glaze I saw with this product. Glaze can be a tricky thing to get right, and your cabs were so subtle and nice. Cheryl…I love pink!!! As a matter of fact, my countertops are pink, but they are more than 20 years old and destroyed…LOL! I’m actually going to get a brown granite with a hint of pink.–my poor husband! Thanks for the compliment on the glaze. I’m guessing I got it down pat from doing silly Christmas ceramics for 20 years. I love that we are able to save lots of money by being creative and coming up with solutions to the pricey renovations! Have a great one! You did a great job on your kitchen cabinets. Looks like you had success with the kit. Your hood over the range is awesome. I like to patina look. We took a look at the cost comparison of this product versus buying the individual parts separately. If you would like the link to the file let me know. Thanks Khaki! Yes, I’d love to see a comparison of the costs. I will say it was well worth the money…especially considering the costs of new cabinets…LOL! The range hood refinish was a necessity when I bought the house 17 years ago. The former owner scratched the stainless steel hood with steel wool! My solution was to use craft paint that actually rusts the surface and gives it a patina. I then applied a clear matte sealer. Only problem is cleaning it. You have to just dust it with a damp cloth (which takes off a little of the color). But not so much a problem…it’s survived all these years…ha ha! I bet the hood looks even better over time as you take some of the finish off when you clean it. What did you use to get the paint to stick to stainless steel? Just a thought… what if you clear coated the hood with a water based Poly. The clear coated poly would probably work…but I do like the natural look of it. Thanks for the cost comparison link! Thank you so much for doing this review!! Your cabinets are the cabinets I have been dreaming of since moving into my home 12 years ago~they are gorgeous!! Because of this post, I will be purchasing the Rustoleum kit in Espresso. My cabinets are very plain, with no real detailing for the glaze to catch in, which I think is key when choosing the antique color you used. Thus, I think the Espresso is the best option for our dated walnut (can you say 80’s?) recessed panel cabinets. We will add crown molding along the top to make them look more customized. I can’t wait to get started. Thank you! Excellent! Thank you. I’ve been trying to figure out what to do with the old cabinets in this house and now I know what to do. Dan…Get to work! LOL! Hope you have enough success as I did with the cabinets. Now I’m thinking about getting some old cabinets for my basement and just redoing them. What made you choose the white kit? I’m torn between the white and linen. Your kitchen looks amazing!! Thanks! I chose the white knowing I could make it as dark as I wanted using the brown glaze. I also thought it was antiqued enough that I didn’t need a darker base than white. And it’s not white at all. Good luck! WOW!! We have the tan brown granite and a very similar backsplash that you picked. 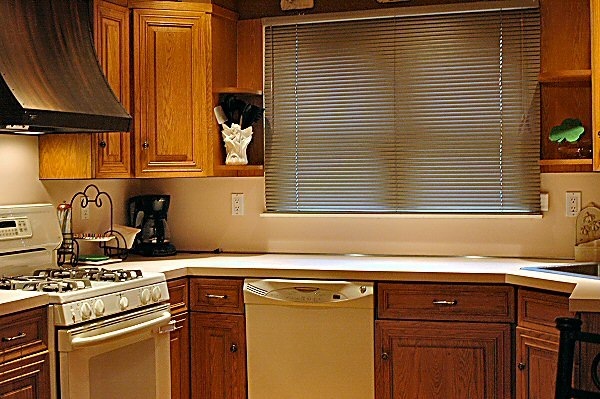 Do you happen to have an updated picture of your kitchen with the new granite and backsplash? We are thinking of painting our cabinets this same color but I am unsure because of my white appliances and floor color. Would love to see a completed picture including your floors. Just finally picked out the granite, so it should be installed within a few weeks. I ended up picking a brown sedona color…with a hint of rust and hardly any black. I’m doing a beige Travetine Marble in a harlequin pattern for the backsplash. My house was built in the 50s and has its original hardwood floors (which I love and have refinished every few years). My appliances are bisque (closer to white than beige). The lighest cabinet color base is the white (which I used). You could definitely use it. Just use your glaze sparingly. Good luck! I’ll post my pics when the granite and backsplash are installed. … WOW, gorgeous!! Thanks for sharing. This is a basic question – – did your Home Depot have actual wood samples of this kit “painted up” in their display or just the typical color cards/paper? I’d like to feel and touch the product, to get my own assessment how much this would cover the grain of my builders grade oak cabinets, Makes sense you did more coats than the instructions directed. I’m comparing this option to another solution caromal colors the cons of which are: much more limited color selection and a bit more rustic looking (has an optional ‘chipping coat’ there for those who want more distressing and glaze) The savings you described are dead on. There is a local company here that paints cabinets, and my quote was around $3500. While on one hand, it sure would be nice to do nothing and come home to finished cabinets, i much prefer the DIY savings!! As a note to other readers, I found a cheap “spare cabinet door” at my local IKEA in the bang and dent area. Definitely will be a good practice piece to gain confidence. Rex…thanks! No, Home Depot did not have actual samples, only the color card display…totally useless. I think the Rustoleum would definitely work on your rustic cabinets. And yes, buy extra as the better the base coat, the better the finished look. 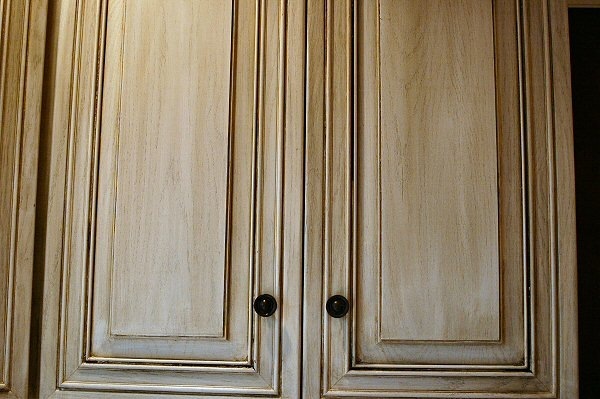 If you want to add even more character to the cabinets, you can easily “knick” them before you do the glaze coat. I accidently scratched the cabinets in a few spots prior to painting the base coat and it looks even better…LOL! I’d love to see your cabinets when you’re finished. And honestly, it was easily to do…just time-consuming. and there is no way I would pay someone to do this as it doesn’t take much skill. I just used this on my kitchen as well. My husband and I chose Espresso and we skipped the glaze. I love it!!! It was A LOT of work..but it looks like we have an entire new kitchen. We also used the countertop kit and re-did our countertop as well. I can’t believe how our kitchen looks now. Highly recommend both! Robyn…I think you were wise to skip the glaze when using a dark color such as Espresso. I bet it’s beautiful! The cabinets wore me out…I can’t imagine also doing the countertops. That might send me over the edge…LOL! Your cabinets look awesome! I am attempting to convince my husband to let me try this product on our top cabinets only. We moved into our home a year ago and the old owners used two different wood finishes on the upper and lower cabinets. They are high quality wood, but I just don’t like the look. 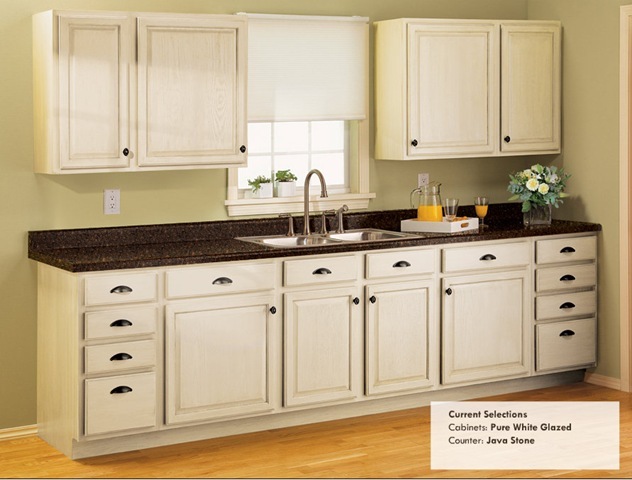 I was thinking that a paint color, like white would look nice on the lighter (upper) cabinets. I was reading some of your posts, though, and it seems that you don’t suggest not using the glaze. Can I still get a white finish using the decorative glaze? Second question: how does this product hold up over the long run? Does the paint/glaze chip? 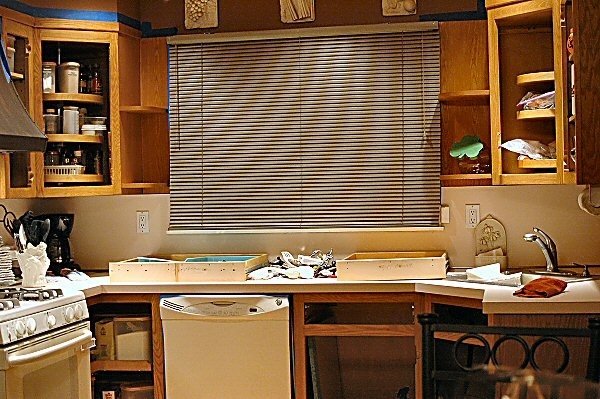 Or for the most part do your cabinets look the same as when you first finished the project? Thanks for posting this…you did an amazing job! I used two large kits on my living room paneling. It looks fantastic!!!! Do you have a pictures or you kitchen? I am also thinking of doing espresso. Appreciate any advice you can give. I am glad that you had success, but I would let your readers know that you MUST be sure about your color choice. Rustoleum will not sell you more of ANY parts of the kit. I bought the large kit in “Porcelain”. I painted the inside of one of my cabinet doors and it just wasn’t right with the rest of the kitchen (tile, wall color, etc.). 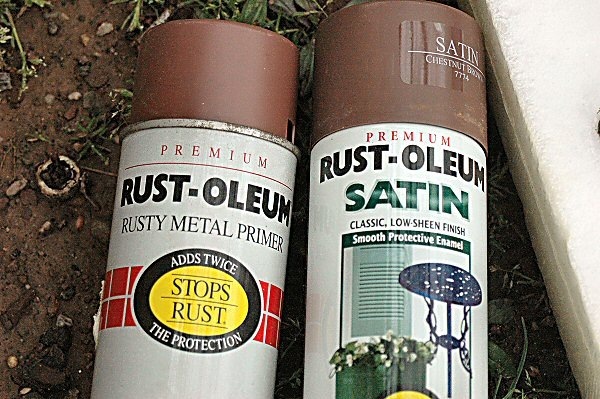 I called Rustoleum and BEGGED them to sell me (SELL me, mind you, not give me for free) another can of the base and they WOULD NOT do it. They said I would have to buy an entire whole kit which costs $150.00. Further, the representative would not let me speak to anyone else or transfer me to anyone else in the company!!?? Sorry, but that is really poor customer service. The kit is very expensive in the first place, but their inflexibility to help you out is absurd. Even if I could afford another $150.00 kit (which I can’t) I would never buy anything from them again. “Satisfaction Guaranteed” my foot…..
Tascha…you can use just the base color if you want and omit the glaze, but you have to use the sealer to protect the finish regardless. My cabinets still look great. Thank you for the info, and you did a fantastic job! 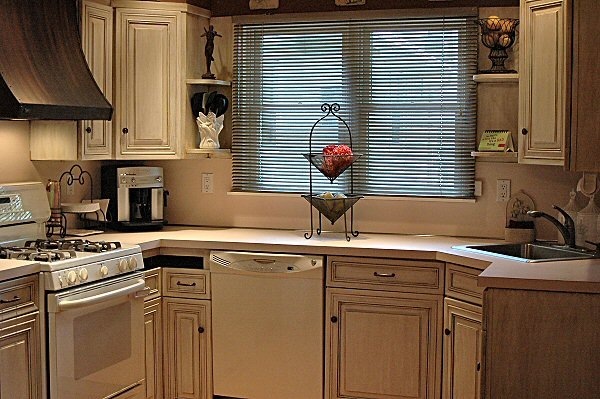 We really want to “update” our 1984 dark kithen cabinets, but can’t affored new. I have looked at making new doors, adding veneer to face frames, etc, but this just makes good sense. I had rather wait until I can afford new, and at least get something done now! We will give this a shot and hope for the best! Thanks ! First off, I feel so lucky to have found this blog! My husband and I just bought our first house and were looking for ways to spruce up our new kitchen cabinets. My question is really simple (forgive my blond roots. Lol), what do you mean by light or dark kits? Does the light and dark have anything to do with the glaze? I want my cabinets to look similar to yours and I want to make sure I get the right kit type. Thanks! Thanks for the reply Lisa 🙂 I have read through the posts and if you don’t mind, restate, I think I missed something. I’ve watched the video too. I am picking the light kit too, going with biscotti (I think) based on the color chips etc. It’s really hard determining color not being able to hold a true “chip” – (After the base coat the paint guy will mix the biscotti formula into the glaze? Here, correct me where I am wrong. Base, glaze, seal. Cleaning/Prepping if you aren’t going to do this part right, don’t do it at all. Paint on base with good coverage – but not a thick coat – glaze brings out the beauty of the wood under and must be done quickly. Then seal. Allowing applicable dry times at each step. Sound right? So far I have tiled the floor, tiled the backsplash, painted and papered, bought an island (unfinished) ohhhh and I got rid of electric, added a gas stove after no power for a week in October ! This has kept me busy all winter. Last but not least, cabinetry.Your blog is awesome. 🙂 and I would not be taking the next step if I hadn’t found this page – your pictures are great. So great too look back and say YUK at what was there before!! Buy LIGHT paint kit and have them tint the kit to the color you want (Biscotti). First use the DeGlosser to clean the cabinets. 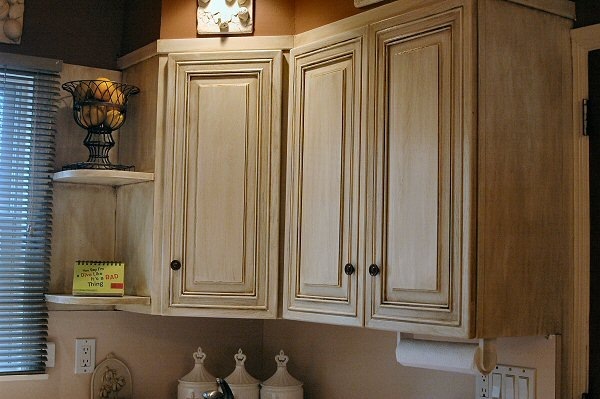 Since it has been a while since you have done your cabinets, can you comment on how the finish is holding up? Sounds like your method worked out well for you. I’d love to see a picture! 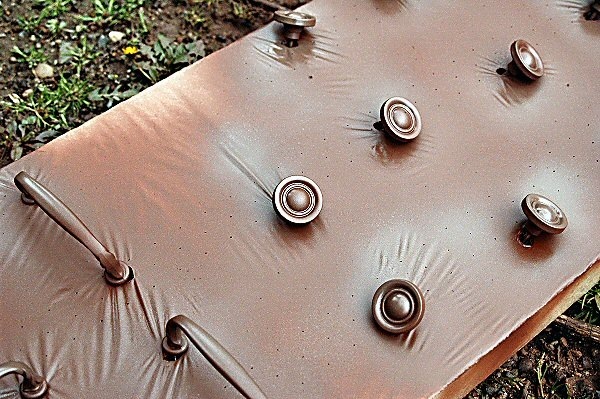 Yes, I agree…there probably is a much cheaper way to do the Rustoleum method. But honestly, I have to say I liked the idea that everything in the Rustoleum kit was water-based and had clear instructions. And you are right…I had to educate the guy at Home Depot…he had no idea was the Rustoleum kit even was and that it had to be tinted before I took it home…LOL! ROTFL Kathy! Hurry, get in the car and get over to Home Depot! Just break it all down in steps and you’ll get it done. I was overwhelmed at first, but little by little, it got done. I couldn’t be happier and you will be, too! Cabinets look as good as the day I finished them. Making sure you have the final clear coat on good is the trick to protecting them. Still am thrilled with my cabinets. Go luck! Thanks for posting these beautiful cabinets. I am in the process of remodeling the kitchen and the cabinets are next. I love the color you chose as that is exactly what we were looking for. What color scheme was it? I use WHITE and then the regular glaze that came with it. Hope that helps! LOL Kathy! YOU CAN DO IT!!! Once you get started, you’ll see how easy it is. It’s almost foolproof! Can’t wait to see how your cabinets turn out! Be sure to send me some photos! So one more question. You told me you used the WHITE bond coat. Did you tint the base coat or use it right out of the box? Robyn: They tint the base coat at the store. I used the lightest color which was WHITE. About to try this product on some unfinished oak cabinets.. Really hope the dark come out as nice as yours.. Great job!! so excited…!! Just like you: staring at cabinets for years and wishing I could change them without all the stripping and sanding. It’s a dream come true. I’m totally going to do this. I stumbled upon your site while researching Rustoleum Cabinet Transformations and I love your step by step blog! 1) how did you get your cabinets to not just look white, but to have that antique appeal where there are some dark grains throughout? 2.) 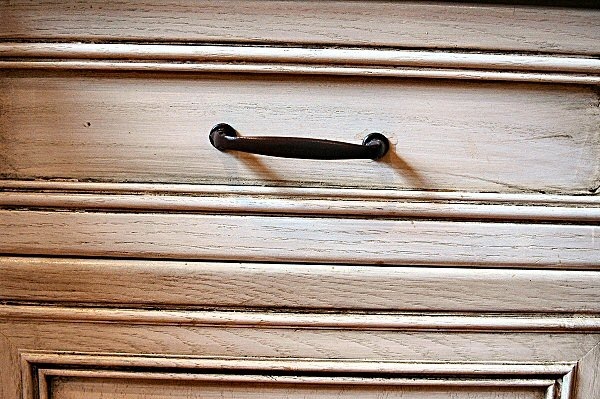 Did any of the sides of your cabinets have non wood material, such as a film that looks like wood? I have this on a couple sides of my cabinets and I am not sure how to handle it. I was thinking of maybe putting wanescoating on it, but then I am concerned the stain wont look the same as the cabinet/doors. 3.) Overall, from start to finish how long did it take you, total “Man Hours” or Lady Hours :-). 4.) What exact base/tint combo did you use? HI There! I am thoroughly impressed by your results. I have been researching this product for some time and have mixed feelings from the results I have seen. I have oak cabinets to begin, but also some side paneling on a couple of sections including my island. I am not quite sure what to do there. Did you have any of that? 1.) Did the original wood grain of your original cabinets show through the whole time during the process? I am really nervous that this work is going to end looking like a paint job. If that happens my wife will kill me. 2.) My wife loves the antique look, just like you did. How did you get some of the dark to show through the stain? Meaning, your cabinets show that antique finish and not pure white. How did you get it like that? 3.) How long did this take you to do? Total hours if you added it all up? 4.) 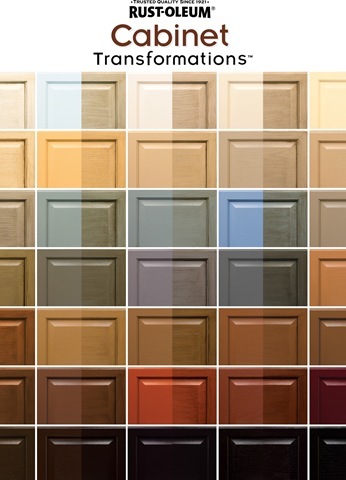 What exact color/tint did you end up using and what origina ltype of wood cabinets do you have? This blog was actually the deciding factor for my husband and I to take the plunge and change our cabinets. We’re (ahem… I) am half way through, but its amazing. I was very hesitant to move forward with the glazing, but its turned out great! I didn’t think I’d be able to make them end up looking like yours, but they do. 🙂 So worth the effort. Thank you so much for doing this and blogging about it. I’m going to end up with a kitchen I love instead of loath! I’m in the process of putting on my final coat with my bathroom cabinets. I did use the glaze and went with espresso. I’m going to do the same in my kitchen, except omit the glaze. I found with the dark color the glaze took off some of the base coat. I just bought a new brush for the final coat. This is the 3rd coat for me. Maybe it was my brush, but I found it hard to apply evenly. How many top coats did you do? Here I go with new brush in hand. I love your cabinets, and hope mine are just as nice. Love these and thanks for sharing! I also like your wall color! Do you have the wall color name? Thanks again! This was extremely helpful! I really love how your kitchen looks. I want a similar look with the decorative glaze – your “pure white” looks to be somewhat ivory with the glaze and this is so what I’m after, is this correct? I’m thinking of doing the same colors for my cabinets. They are also 17 years old and they are not as detailed as yours are just the old oak with high trim and sunk in front doors. I have two concerns which are do you think with out having the detailed cabinets it will still look good. Also I have never glazed before and because you reference so often about difficulty doing it I have some concerns there. I see that kathy caron had not done glazing I am wondering if you have heard from her and how it went for her. If you have any suggestions for someone who has never glazed inorder to put my mind at ease to attempt this project I would appreciate your comments. I will also be adding some crown molding trim on top and maybe botttom of the cabinets to update the look of the cabinets. My concern would be color matching when doing this. I dont know if I can purchase it in the oak look or not. If anyone has any information on that that would also be helpful. I’m thinking of doing this for my kitchen cabinets as well and was wondering what techinque you used for applying the glaze? How long did you leave it on for? I like how your cabinets turned out but I’ve seen some other ones online who used the white kit and the glaze and it looks way to streaky for me. How did you get the glaze even without the steaks? I live in Indy and my Home Depot guy is the one who talked me into buying the kit. He had refinished the cabinets in their store’s breakroom using the Rustoleum kit, and he apparently takes people back there all the time to show what the product does. He walked me back there and showed how he used the dark kit to make the cabinets espresso (and we wanted light), but still, it was nice to see the before and after. And boy, it sure was a brilliant selling technique! So far we have deglossed and painted the cabinets three times (pure white). I think they look fine after just three times. l hope tomorrow we will be ready to glaze. Halfway there! Make sure and refinish your countertops with the Rustoleum Stone Effects Product rather than spending your hard-earned cash on stone. Thanks to your blog, I got the guts to do my own cabinets (read: convinced my hubby to do it since I was 8 months pregnant at the time) You can view my transformation at my blog at http://roseandcole.blogspot.ca/2012/06/rust-oleum-cabinet-transformations.html Thanks again! Hey your cabinets look great! I’ve been wanting to do something like this for my ugly oak cabinets for a long time. I also need to buy new appliances (to get rid of the avocado ones). Do you feel like the white appliances work with the cabinet color? I would rather not buy stainless steel if possible. From the picture yours looks great. What do you think? Hey Lisa, I sent the rustoleum link to my GF, and she found you thru Google. Love what you did. My big question now? How does it look a little over a year later? Did it hold up? Cheers! yes, pure white looks off-white once you apply the glaze. thanks Diana! I think my wall color is Benjamin Moore’s Fox Run. I had regular medium oak cabinet. I used 3-4 coats of pure white base, then the glaze. It came out antique white. It took a lot of time, but I did get some help. the finish is holding up pretty good! I was online looking for some tips and found your page. I have just done our guest bath and utility room cabinets. My only issue is when I go to remove the glaze from the edges of the cabinet door I either take too much off or what is left behind doesnt look natural. Any tips on getting the cheese clothe into those small angles to remove the glaze and have it look more “natural”? yOUR KITCHEN IS BEAUTIFUL!!! YOU DID A GREAT JOB. Lisa, love the blog. Anxious to tackle my kitchen cabinets this winter. My question is, did you paint both sides of the cabinet doors? Is there a calculator somewhere that will help me figure out the square footage that I will need to cover? Thanks! BTW yours look amazing! Great job and Congrats!!! What color did you have your base coat tinted? I did linen and it is very white! I love your color!! I used white. it was the lightest color available. the color get darker from the gLaze. Thanks for posting about this. I’m getting ready to buy a house and it has the same color cabinets. I was thinking about using the Rustoleum Cabinet Transformations but wanted to make sure it gave good results. You have sold me on the idea! Your kitchen looks amazing! thanks Nia! It was definitely worth it! thanks Kristy! I’m sure it will work fine. With more wood grain, the glaze will emphasis them more, but it should still look good without wood grain. Good luck with your cabinets! Jenny…yes, I painted both sides of the cabinets. If I remember correctly, there is a calculator on the Rustoleum website to figure out how much paint you need. I just doubled what it said and was left with some extra (for touch-ups, if necessary). Hope that helps! Hi Diva, First of all nice job with the cabinets. Its more than a year now, do you see any chipping of the color? I saw it in 1 of the reviews. I am planning to get the darker shade on my dull oak cabinets. Any last minute tips? Thanks. Thanks! The paint job has held up pretty well. There is a little chipping on just one of the cabinets that we use most often. I’ll just give it a little touch up when I remember. Considering the way my family slams cabinets around it, it is amazing that anything holds up this well! Beautiful cabinets!! I want the SAME look!! My cabinets are darker then your previous oak. How long did you leave the tinted glaze on before wiping it off? What do you apply the glaze with? A Brush, foam brush, cloth? Any special techniques or tips would be greatly appreciated!!! Thanks in advance!!! First Time Glazer here! Can you tell me how you applied the glaze and how you removed it? I did two glazing sample pieces and mine is turning out too streaky or stripe-y…I’d really like it to turn out more like yours – aged, emphasized wood grain and a little glaze left in the crevices. I applied glaze with a sponge brush and removed it with gauze. Should I apply it against the grain and remove it with the grain to avoid the streaks? I watched a tutorial where a woman used a big (car-wash-looking) sponge to really soften the glaze…followed by a big soft blending brush…. I’m on the second coat of base paint. Need your advice quick!! Hi dosmeticdiva, i`m on the process of doing my cabinets and i came accoss your transformation, WOW, it looks awesome!! 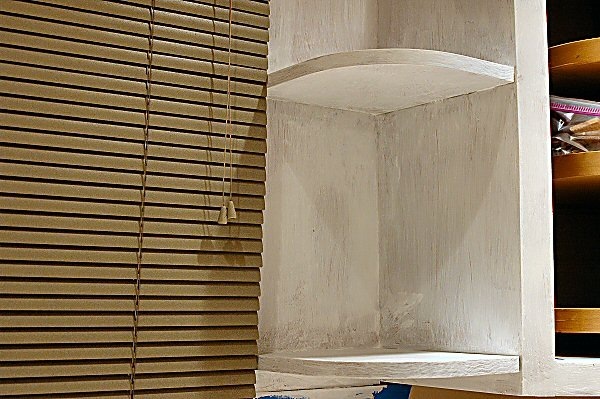 I wanted to do the white washed look, kind of what you did with your cabinets, can i ask what color you used and how much glaze to you apply? I have Almond color appliances and it looks like you have them too. Unless im worng and you have white? My kitchen is set up the same way except the stove is on the other side. Precisely how long did it require u to post “Diva’s Rust-Oleum Cabinet Transformation – THE DOMESTIC DIVA’S DISASTERS™”? I am impressed we have just bought the kit .white and just got started.your steps are very helpful.Will let you know how I do. I’m looking into using this system, but I’m not thrilled with any other the color options. I’m going for something a little bolder. Can you tint this any color you want? or just the colors offered online? You did a great job with your cabinets. I am hoping to achieve similar results with my cabinets. I am most nervous about the glaze. 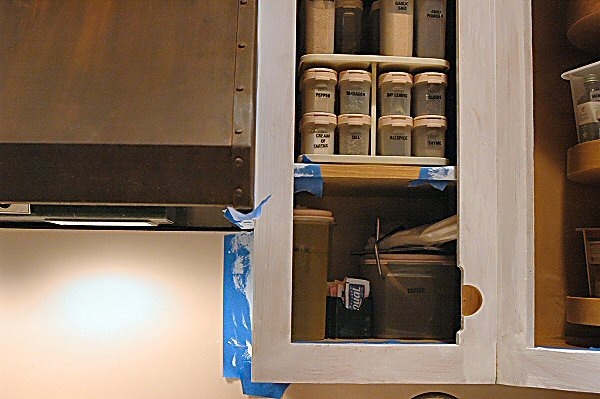 Did you add glaze over the entire cabinet and more in the recessed parts? Thank you for your help!!!! Your cabinets are inspiring. My husband and I are applying cabinet transformations in Pure White as well. This is our first DIY project. We are currently applying what is now the 3rd coat of bond coat which worked well on the trim. We may end up having to do 4 coats on the doors as you did. My question is about the glaze. I’ve never done it before and I am over-the -top nervous about messing it up. Can you go throught the steps as you performed them? Thank you!!!! This is amazing. You did a beautiful job! I just bought the kit and realized I forgot to get the bond coat tinted, so I’ve been researching the different colors and I really want exactly what you have done here. I think I am going to prime first because my oak cabinet’s wood grain is really strong, but I can’t wait to have a transformation like yours! I love your hood over your stove! It’s incredibly beautiful and goes so well with your new cabinets!!! I am a Handyman in San Diego California, I was working in a complete remodel in Borrego Springs California, the clients saw cabinets for alot off money,and the waitningwas 3-4 weeks. So i told her i can transform her old ones in to even better look. I named them Rustic Maple. Lisa I am in the process of redoing my cabinets after admiring your 😊. I would like to know during the glazing process, did you use the sponge applicator on all or a small paint brush to get in the cracks of the doors? Thank you so much for your help!! Love your cabinets…hope mine turn out just as good as your!! I am just now finishing up my kitchen using the Rustoleum kit, in a custom-tinted color. My HD did custom tint for me, and I made sure to buy more than enough (2 kits). I’ve previously done three bathroom vanities in Espresso (with glaze on two — actually forgot to use it on the third) and would recommend this over and over and over again. Yes, it takes time, and it’s best to go slow and review the video/directions on each step, but it’s SUCH a $$$$$ saver, and it looks so fantastic. My custom tint was because I wanted a taupe color, and there really isn’t one listed. I found a sample in the HD cabinet section, took it to the paint department and Sunni worked and worked to get it matched. And I LOVE it!! Good luck to those who take this on. My old 1980’s oak cabinets no longer drag my kitchen and bathrooms down! wow!! I haven’t seen anything like this, it’s simply beautiful! Did you take off door hinges. Was it difficult remounting doors? Your transformation is incredible! My cabinets are currently white and I hate them. Would this product work on white cabinets? These cabinets are phenomenal! Is it the glazing process that gives them the antique look? ( like the brown showing through?). This is exactly what I want my cabinets to look like!! I need to do this with my cabinets but afraid with white appliances the technique will make my cabinets look dingy? Do you feel this was the case with your kitchen? This looks great! I have oak cabinets and I’ve read several reviews that the oak stains through so I’m nervous to do this if at the end I’m going to have yellow’ed cabinets. Maybe that’s why the extra coat is needed? Did you see any staining coming through when you did the top coat? I applied an extra coat to my oak cabinets and had no problem. Good luck! I used this product on 40-year-old oak cabinets (18 doors, five drawers) and am very happy with my “B” results, all things considered. With cabinets so vintage, this was nowhere close to a weekend (or a week’s) job. Going from medium-brown to off-white, I encountered several challenges worth passing along. 1. Protect the wood. In using the scrub pad to remove the original sheen, I scrubbed and scrubbed with serious elbow to grease remove heavy polyurethane coating. You do indeed need to thoroughly remove the old finish, but try not to bite into the wood. Slight streakiness (depending on room lighting) in the final finish resulted. I can live with it. 2. Beware the bleeding stains. There’s a caution on the box for this particular color, but I didn’t see it. This was a frustrating, time consuming, confounding problem—UNTIL the issue was diagnosed and promptly SOLVED. Black streaks—from fairly bold to fairly faint—magically kept popping through as I applied my top coat. I added more coats. I touched up. I painted with the grain and against. I light-stroked and heavy-stroked. All to no avail. The streaks persisted. I called Rustoleum—twice. Yep, I’m using a quality brush. Yep, painting with the grain. I asked handyman friends. Can’t explain it , they said. FINALLY, out of patience and time (couldn’t ask my family to go any longer with no-door cabinets) I had resigned to “good enough.” I called Rustoleum with an unrelated question. The rep heard the resignation in my voice and inquired. Right away she said, “I know your problem and I’ve got your solution; we can fix this today.” For your situation, you’ll need a primer—otherwise the oils or resins in the wood will always and forever win out, she said. I could have added paint coats till the cow came home. Used the prime, reapplied two top coats. VOILA! 3. Those dang cabinet hinges. I was determined to get new hardware. Couldn’t find style I wanted nor anything to just-right fit existing holes. Again, I was at wit’s end (and my doors and hardware were off. I had visions of drooping doors. A Home Depot employee took a look at my grimy, old-fashioned hinges and said, “the intricate design and shape of what you have is much more interesting than anything modern; I’d kill for hinges this nice and unique. So I cleaned up and spray painted my vintage hinges. It took time and some unique potions to get rid of the built-on grime. But well worth the effort. Perfect alignment back in original holes. I have “bisque” colored appliances (a very light beige color). If I had white appliances, I would look more to a gray color. thanks! Yes, the brown glaze is what gives it the aged look. I just did one coat of sealant. Perhaps your paint layers weren’t smooth. thanks! Would absolutely work! Good luck! My cabinets still look great. Just a minor worn spot or two on the most frequently used doors. thanks for sharing that info Donald! Glad you figured it out! yes, I took the hinges off. The most difficult part was reinstalling the hinges! Melissa…I used a sponge brush for all coats. Thanks for sharing such a detailed tutorial! I’m just a little confused about the tinting? I have dark old mahogany cabinets and I want to achieve the same look you achieved? What would you recommend? I didn’t know you had to tint it. Which do you tint? The base coat or the glaze or both?! Oh and I’d like to know how it’s holding up after a few years??? Thank you for posting this! We have oak cabinets too (and I hate the color!). You did such a great job! I think we’re going to give it a try! I LOVE your cabinets. Well done! I’m getting ready to refinish ours but my biggest concern is the length of time it takes. How long where you in chaos? Hi thedomesticdiva – Your kitchen and cabinets look great! I thought about painting my golden oak kitchen white, but now having 2nd thought. Painting it white, I’d still see the oak grain through the primer/paint. From the pictures, it looks as though the oak grains blend in very well with the Rustoleum paint and glazing. How is this product holding up after nearly 3.5 years? Did you apply paint and glaze with the black foam brush? Hi thedomesticdiva. Your cabinets and kitchen look great. My plan was to paint my Golden Oak kitchen cabinets white with Benjamin Moore paint, but now having 2nd thought after seeing your blog and pictures. How are your cabinets holding up after nearly 3.5 years? From the pictures, it looks like the oak grains blend in really well with the color and the glaze. 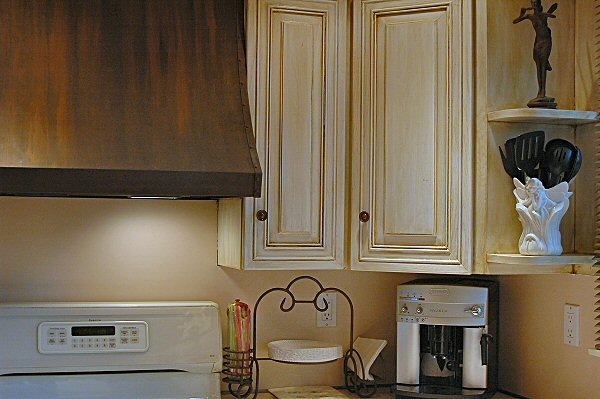 Would you recommend someone to paint their golden oak cabinets using Rustoleum method or White Enamel Paint? these are gorgeous! Well done you! Did you do the insides as well? The cabinets look amazing! Can’t wait to see the countertops and backsplash! Thanks for posting! I just started this process using the Light Kit and I was beginning to panic at all the streaks! You are absolutely right about the frames needing 3 coats & doors needing 4. My cabinets are an awful Melamine (false wood) product. Thanks for the encouragement to push through! So beautiful! You have encouraged me to tackle my kitchen cabinets. I love the way yours turned out. 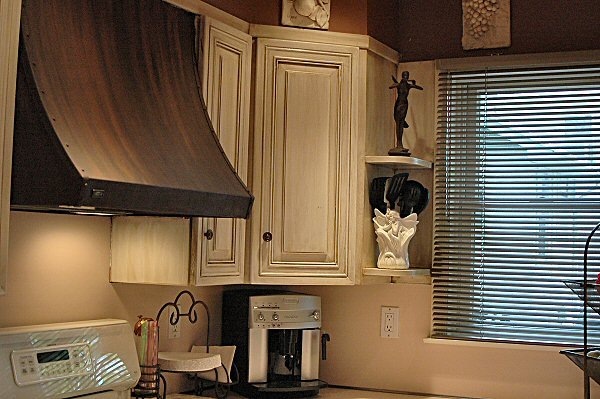 Also, I really like your vent hood over your stove. Do you know where it was purchased?? Thanks! Wish me luck, think I’ll need it!! Love your post and the results! I especially appreciate your ideas to “share” some of the tasks :). Has it held up for you? I have a similar color oak, and plan do to chocolate on the lower and exactly what you did on the uppers. Love, love, love the copper range hood. Where did you buy it? Your article gave me the confidence to renovate my kitchen. The cabinets were honey oak and now they are a beautiful antique white. I would recommend this product to anyone looking for an update. Thank you for documenting your experience. 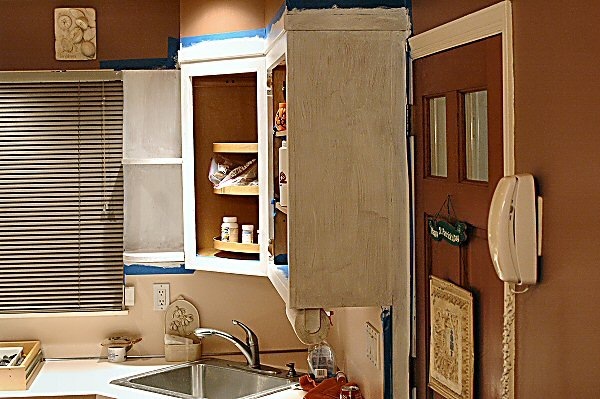 What kind of paint brush or roller do you suggest using for the cabinets? it was a scratched stainless steel hood that I painted! yes, it’s held up pretty well. the range hood was a scratched stainless steel Broan hood I painted. thanks! 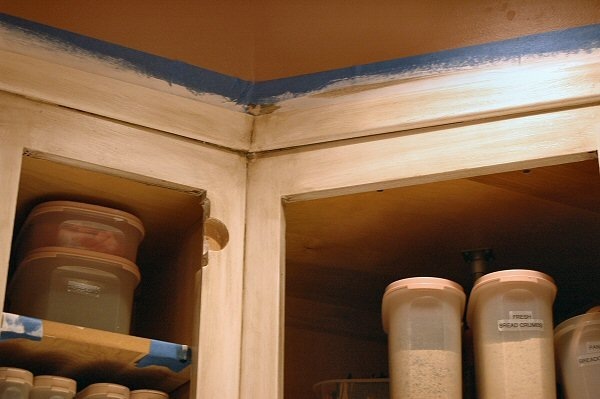 No, I did not paint the insides of the cabinets, but did paint the back of the cabinet doors. 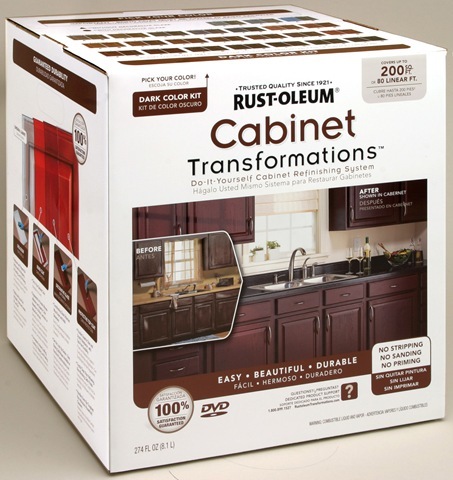 I would absolutely recommend the Rustoleum products for cabinets over any other product. Still holding up pretty well after several years. you can still see the wood grain after finishing them…but not prominent. They look great. And yes, I used a black foam paint brush! Where did you get your vent hood? Are the cabinets easy to keep clean from grease etc? 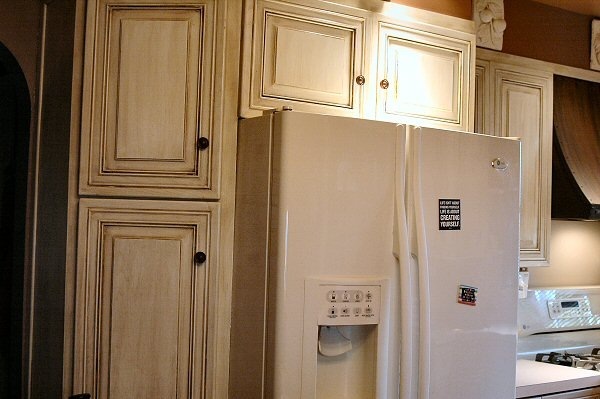 Wow, I just found your blog post on your cabinets. Your kitchen (before) looks much like mine…golden oak, only my cabinets are homemade by the previous owner’s dad. Having said that, the style is nice and quality is good too, I just don’t like the oak. We have lived here 3 years, and finally, my hubby has agreed to let me paint them (apparently, you just don’t paint solid oak…thats what Ive been told…lol) He actually saw the rustoleum kits and suggested I look into them. Your after photos are also what I want…a cream with glazing and love your dark counter (we are getting one of those as well as a composite sink and new taps) and a new kitchen floor. I see your original post was from 2011…now 2016, how are your cabinets holding up? I did read an answer I think in 2014 that you had a few worn spots…are they fixable? Or do you have to live with it? Are they very noticeable? Great job you did and thanks for all the details…Im ready to get moving on this project!!!! What tint color did you use? How did you do the blacklooking lines on the face of the cabinets ? Have you hear of milk paint? I was considering using this with a clear gloss overtop to protect. So did you do the light coat kit or dark coat kit? Did you use the Light color kit or dark color kit? I love your kitchen cabinets and it’s giving me more confidence to believe I can do this with my 1970’s honey oak kitchen cabinets. I love the glazing you did. What color did you use for the glazing? Do you have a tutorial on how you did your Glazing? 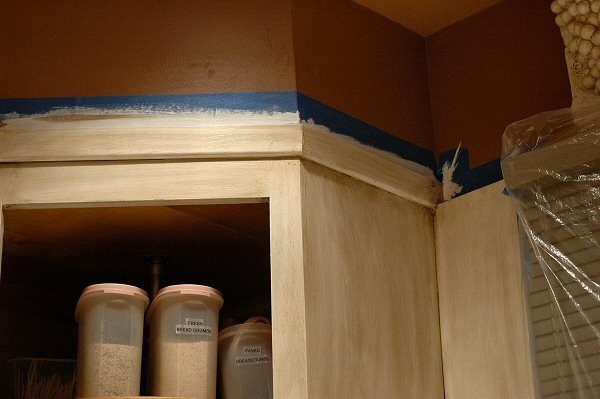 I like how the glaze is ‘outlined’ around the edging of your cabinets doors!! How did you do that?